The cryptocurrency market is still subject to the influence of short-term volatility surges, but at the moment consolidation is worsening. An exit from local range can “stumble” on the border a medium-term flat. And only the break of key levels of support or resistance will show the valid moods of cryptomarket players. On an hour chart we can see that consolidation continues. The short-term situation demonstrates the completion of a local downtrend by the breakdown of the resistance line. The new impulse of growth will relevant level of resistance — $448,11. Golden crosses on the MACD and Stochastic indicators act as confirming factors. In the future, the breakdown of the current resistance level may open the door for quotes to the resistance of the emerging growth channel - the level of $ 461.40. In addition, it is necessary to consider the possibility of reducing. The current support level is around $ 436.33. 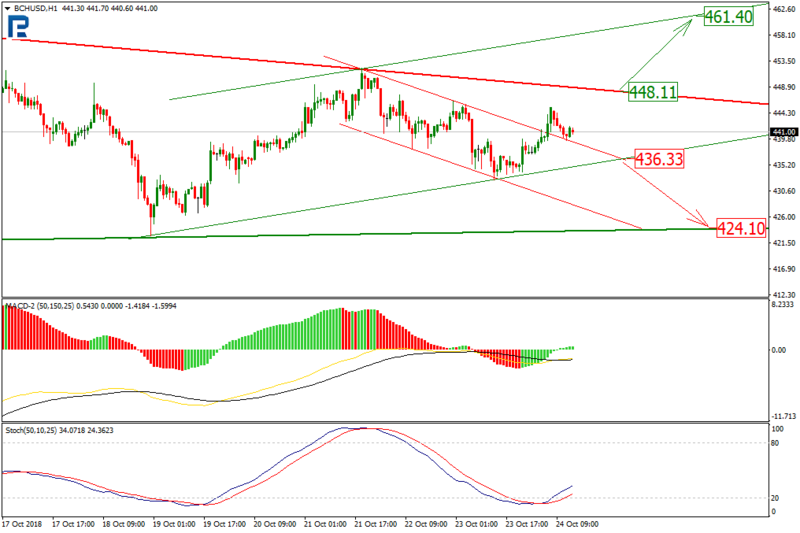 Its breakdown can be a signal of the development of a downward trend to the level of support at $ 424.10. The current EOS dynamics on the hourly chart demonstrates the continuation of the downward trend development. It is also worth noting that the market has overcome the line of support for the medium-term correction trend. Now the price is trying to gain a foothold on the achieved levels, however, an upward movement is not excluded. This is indicated by the dynamics of the MACD and Stochastic indicator lines. 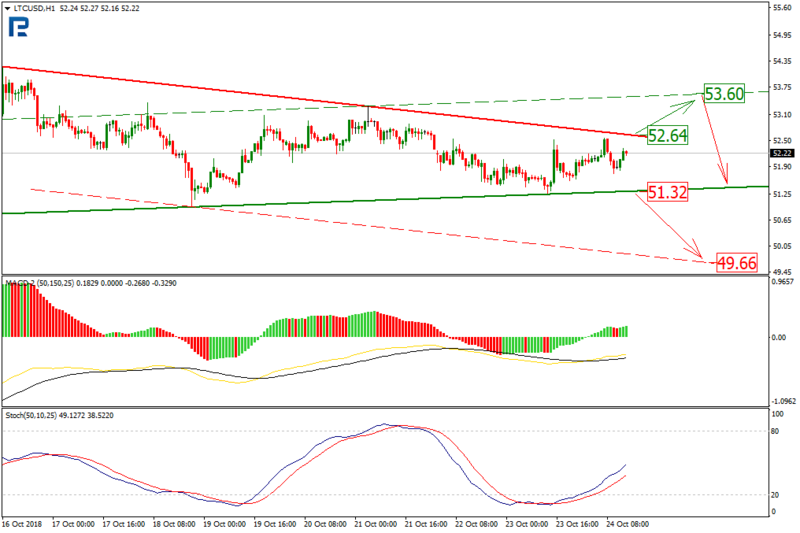 Thus, it can be assumed that the target of growth may be the area of ​​resistance of about $ 5.61. Taking into account the movement in the side, we can expect a rebound from the resistance and a decline to the level of support by $ 5.29. In addition, it is necessary to consider the option to exit from the sideways up to the level of $ 5.92. Since the market is still in a state of medium-term “turbulence,” this may cause short-term spikes in volatility. On the Ethereum hourly chart, we can see that after the breakdown of the support line of the consolidation corridor, the cryptocurrency developed a downtrend, but did not reach local minimum. Thus, the development of the downtrend may be completed soon. In addition, the increase in significant minimum indicates the formation of an uptrend. The indicators of MACD and Stochastic indicators serve as confirmation of the growth hypothesis. A signal for further growth will be the breakdown of the current local resistance level - $ 202.90. 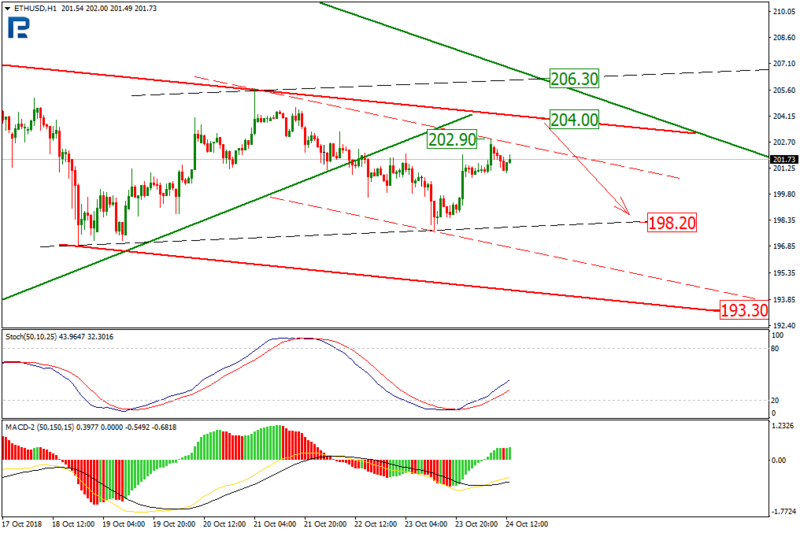 Growth targets are located at $ 204 and $ 206.30, which are in the area of ​​resistance of the long-term downtrend. It is necessary to take into account that the possibility of rebound from the level of $ 204 will allow quotes to return to the frames of the downward corridor and local support at $ 198.20, and then to the level of support of the downward channel at the mark of $ 193.30. 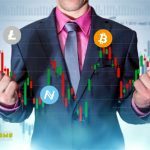 LTC/USD demonstrates the continuation of narrowing corridor development. The result of such dynamics will be the output in any of the directions, since the chances for both options are equal. The current resistance level is $ 52.64. Its breakdown will allow quotes to rise to the level of $ 53.60. The dynamics of the MACD and Stochastic indicator lines indicate the development of the upward movement. But to exclude the option of breaking the current support at $ 51.32 is impossible. Its overcoming will open the way for quotes to the line of support for a potential channel of downward movement - the mark of $ 49.66. XRP/USD demonstrates the breakdown of the support line of the medium-term growth channel. 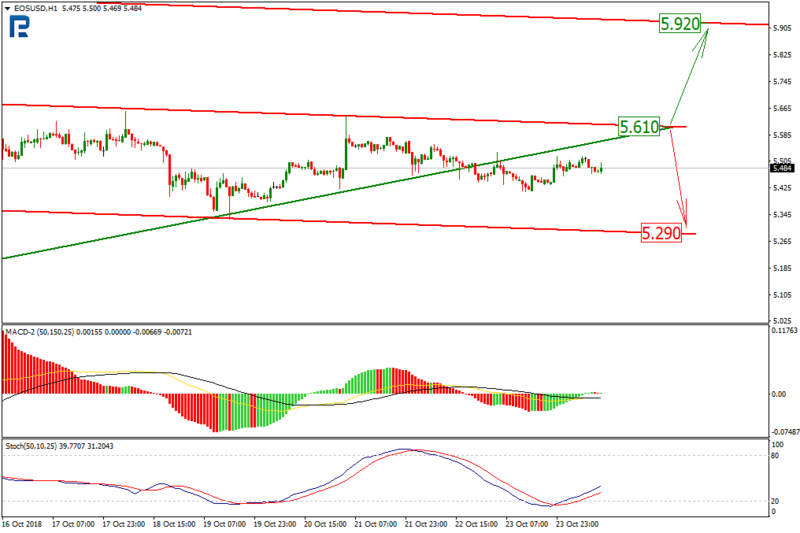 The short-term downward trend completed with the formation of convergence on the MACD and Stochastic indicators and the breakdown of the channel resistance line. The growth impulse is directed to the resistance of the upper projection corridor and, at the same time, to the overcome support line for additional testing at $ 0.4749. 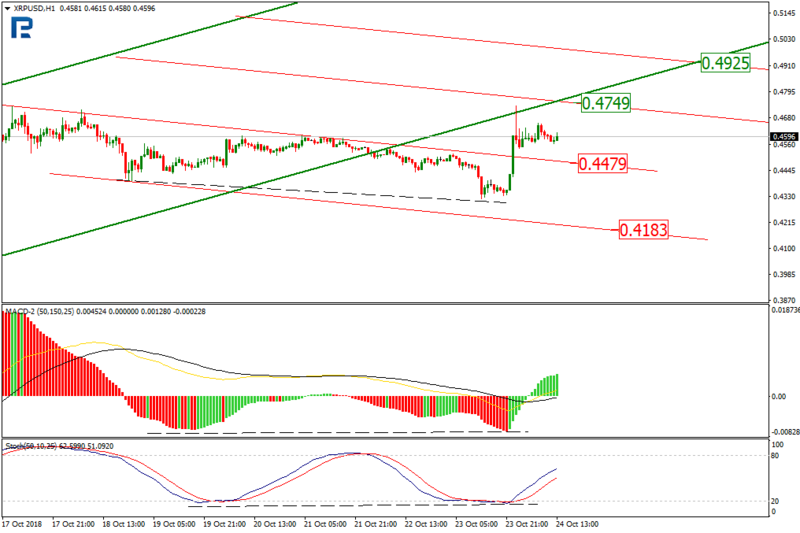 Its breakdown will allow the price to develop an upward movement to the level of $ 0.4925. Support for the current dynamics refuses level of $ 0.4479. Overcoming it will mean a further decline with the immediate goal at $ 0.4183. © 2018 bit.news | queries 214, for 0.470 sec.